Greg Prato of Songfacts spoke with King’s X frontman dUg Pinnick about…Selections from the discussion appear below. Songfacts: Let’s start with discussing your new solo album, Naked. 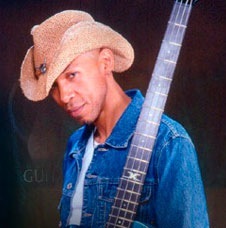 dUg Pinnick: It’s been about three years. I write a lot of music all the time, and I haven’t put a solo record out in a long time, and King’s X hasn’t done much in a long time. But I have been writing a lot of music. I moved out to LA about three years ago and just decided I needed to change my life. There’s nothing happening in Houston where I live musically and career wise, so I thought I’d move to LA and just see what’s out there, see if I’ve got any value in the marketplace. So I got out there, and like everybody who goes to LA, it’s really tough at first. It’s a new city and it’s a hard city to crack. If you don’t know somebody, you’re nothing. LA is like that, we all know that. I realized that when I got out there. It was a bit strange for me at first, because I didn’t know what was going on or why I even moved out there. Everybody tells me that when you first move to LA, you spend about a year and a half kind of freaking out, no matter what. And then sooner or later, you finally settle in. So in my three years of freaking out I wrote a record. The other thing, too, is I really wanted to make a big change in my life, so I literally let my brother move into my house and I packed up some clothes and my guitars and my Pro Tools, and I headed to LA. I lived at a studio tracking room for like a year. I just slept there, made music, and hung out with people. And I realized that I know more people in LA than I know anywhere else in the world. So as I realized that, everything’s okay now. I feel like I’m home now out here, and there’s never a dull moment. But at first, it was pretty rough. I wrote that record out of it. That’s why I call it Naked, because it’s pretty deep and revealing. Songfacts: I always thought your voice would fit very well in the band Velvet Revolver. I interviewed Duff McKagan from that band a while back and I even told him that he should try to get in contact with you and discuss that. dUg: Well, thanks, man. I actually even tried out for Slash’s Snakepit a long, long time ago. The problem I had was that I had a real hard time making up melodies to Slash’s riffs. He’s genius at it. He and Axl, he said for some reason, the two of them had this magic. But his riffs are kind of difficult to make melodies out of. Songfacts: And something else I always found interesting, you also recorded a song with Dimebag Darrell at one point. So I stopped off. And everybody was doing X, it was insane. It was the full house, everybody was on X. There was Christmas presents everywhere. Everybody was drinking. The typical Dime party, as usual. Later on that night, Dime said, “Hey, dUg, would you sing on this song, Born Under a Bad Sign?” And I said, “Sure.” Because we had always talked about doing music together, doing a side project, but we never ever had a chance to do it. We went into the little studio in his garage and sang Born Under A Bad Sign. He had already tracked it with the drum machine and everything. I sang it, and then we got done and kept on partying. One day, after he had died, I found it in my belongings. I was sitting there, going, “Wow, I forgot about this.” So I put it on a YouTube clip just for fans. Songfacts: And what is King’s X currently up to? dUg: …we’re talking about doing another album. It’s about time. I think it’s been five years. We haven’t toured in the US – really any serious touring – in three or four years, maybe more. So I think it’s time for King’s X to gear it up and get out and do it. To view dUg Pinnik’s video for Great Big Thing off of Naked, click here. Would love to see a new King’s X record and tour. One of the most underappreciated bands of all time. Such a tremendous catalogue of music, and looking forward to having them add to it!! !